You know how to work a one-colour version of the lovely brioche stitch (BRK). Now it’s time to add another level —two-colour brioche! We will be starting the Lollipop Brioche Hat (https://www.ravelry.com/patterns/library/lollipop-brioche-hat) by Raine Kruus in this class. Cost: $30 plus tax and materials. Booties? 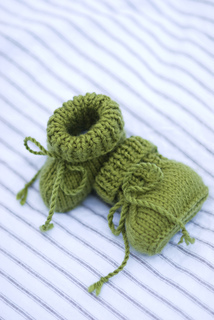 The ribbed cuff and tie help them stay on even the most active of little feet! They are knit flat, and then seamed. Yarn’s 20g mini skeins or a skein of Peppino from Yarns of Richard Devrieze would be perfect! chance to learn or brush up on some cabling skills, and see just how interesting and fun cabling can be. instructions and how to keep track of our rows. life, you will also learn the basics of seamed cardigan construction.